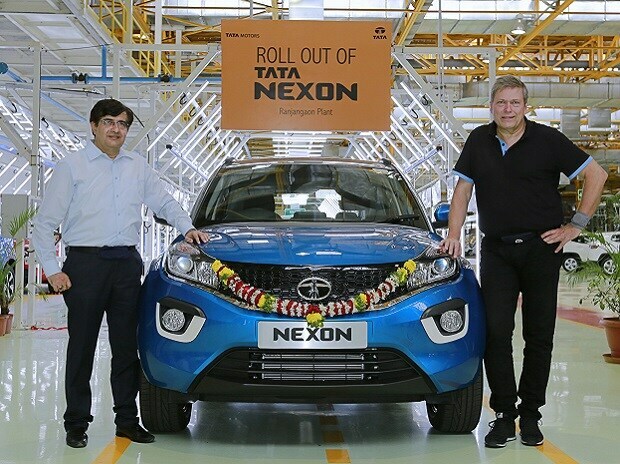 Tata Motors on Thursday flagged off the first batch of its compact SUV, Nexon from its Ranjangaon plant. Nexon is the fourth car after Tiago, Tigor and Hexa designed under the IMPACT design philosophy. Tata unveiled the engine details of Nexon a couple of days ago. The petrol powertrain is 1.2 liter turbocharged engine from Revotron series and Diesel is 1.5 litre engine from Revotorq family. Both the engines will be mated to a six-speed manual gearbox. The petrol engine will be produced in Tata's Sanand facility while diesel will be manufactured in Ranjangaon plant itself. Nexon is a sub-four metre compact SUV with an overall length on 3,995mm from which 2,470mm wheelbase is extracted. It will be equipped with segment standard safety features like front Airbags, ABS & EBD and Hill Assist Control. Moreover, Nexon is also likely to offer a 6.5-inch Harmnn Kardon infotainment system with voice recognition. The top variant will house daytime running lights, projector head lamps, LED tail lamps, rear spoiler and 17-inch alloy wheels. Expected to launch during this festive season, Nexon will compete with the likes of Maruti Vitara Brezza, Ford Ecosport, Hyundai Creta and Renault Duster. The estimated price for Nexon will range between Rs.6.5 lac to Rs. 9.5 for base and top variants respectively.